Ransomware is malicious software that prevents you from accessing your files until a “ransom” has been paid. 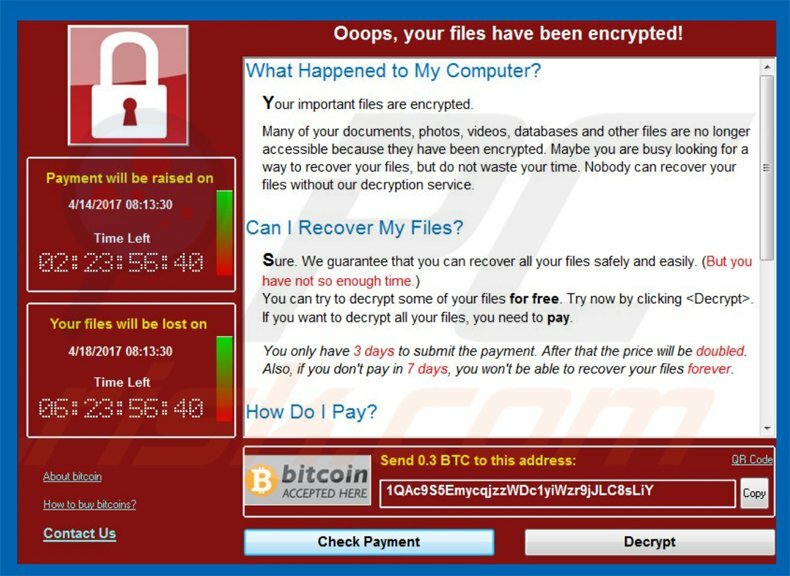 Wannacrypt Ransomware is the latest virus going around targeting out of date Microsoft Operating Systems. Not to always drive home the point, keep your OS’s updated and in some cases devices as current as possible, you might regret not doing this as most affected by the Wannacrypt Virus are right now. If you are operating on a Microsoft device read the Malware Prevention Center page here covering WannaCrypt Ransomware, if you are on Microsoft XP or older there is high risk for this virus finding you. There is a 3 or 4 day period you have to pay the scammers before the price will go up after that time the files will be gone forever if no action is taken by the user. Always stay vigilant when opening, installing downloads and visiting some websites. The post WannaCrypt Ransomware: What To Watch For appeared first on Rev Marketing 2 U. Previous Post: Denham Springs ATA Martial Arts: Site of the Week!